When I teach Baseball Pitching Training I like to discuss a few Pitcher Tips on cold weather training in conjunction with Pitching Training Aids, during the Off Season. Throwing Weighted Baseballs is a somewhat new and innovative technique more and more college baseball programs are implementing. I bring this subject up now, because throwing weighted baseballs is done Only During the Off Season! 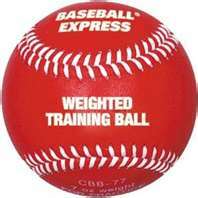 Once Spring training begins or you move to throwing off the pitching mound… stop throwing over weighted balls. So, as a Pitcher tip, let’s examine a sample routine which has been used with great success. The Coach or player should plan on utilizing this workout routine for a duration of 2 months, no longer than 3 months and that depends on other outside influences, such as moving to a pitching mound. The workout should be performed no more than three times a week, mixed in with other strength and conditioning programs. To begin the routine, the Player should jog, in place or moving, for no less than 5 minutes, working up a good sweat, which at the conclusion of jogging the player should perform his stretching routine, which must be a full body stretching exercise routine. The player then performs his 10 Minute Pitching Workout. You heard me right. Ten minutes. I know that doesn’t sound very long, but it’ll become apparent quickly that this short time seems an eternity. 60’ for 1 minute. A cool down. 5oz. Ball, 20 throws at 70’. This variation in weight, but not distance, does not provoke a change in pitching form or mechanics, only increases muscle strength. It Must be stated Never Throw a Baseball Over 6 Ounces ! Although they are available, anything weighing more will only tear muscle down and result in a series of injuries. I realize the throwing of weighed balls appears very restrictive, but anything you drastically vary, and changing the weight of the ball qualifies for drastic, the risk of injury can outweigh the benefits. Just use caution and common sense. This strength training workout is no different than if you’re training for an endurance race of 20 miles while carrying 50 lbs of gear. You wouldn’t consider trying to run the 20 miles or carry the 50 lbs of gear the first day of training. You ease into it increasing the difficulty as you increase your strength and stamina. No different here. 1. You must protect your hands. Drying and cracking finger tips and cuticles can not only be painful, but they can result in you unintentionally over compensating for the pain and reek havoc with your mechanics and form. As your arsenal of pitches grow you’ll realize how most of them are dependent on pressure and grip of the finger tips, which makes sore cuticles no laughing matter. Use hand creams will help relieve any drying and cracking problem. 2. In cool weather it is imperative to work up a good sweat, by jogging or exercising before stretching and always stretch before throwing. You can wear your jacket or overhead sweatshirt while warming up, but always remove them prior to throwing. 3. No different as when your Mom told you to wear a hat to the bus stop on cold mornings … Always wear a cap, preferably a sock cap of some sort vs. a baseball cap. A person loses 90% of his body heat through his head and by keeping the head covered and warm, the body will tend to stay warm. 4. Always carry a clean dry shirt or sweatshirt in your bag so when finished you can remove the sweat soaked shirt replacing it with a dry one. Always have a coat and gloves, regular winter gloves or at least batting gloves with you, as you never know when the practice session will last longer than your throwing schedule, and You don’t want to be caught outside in a wet shirt and no gloves. Finally, if at all possible find a place you can throw inside. A school, gym, baseball school, batting cages. Anywhere inside is better than cold throwing outside. If there are no alternatives, use the tips above to stay warm and healthy. Just as the name indicates, it involves playing catch and throwing the baseball farther distances as your strength increases. Begin this exercise throwing @ 50’ apart, increasing in 10’ intervals until reaching 100 to 110 feet apart. It’s important to realize and remember, although the drill is Long Toss the number of throws and frequency also has an impact on the drill. You’re better off making less throws per session and throw greater distances and more sessions. NEVER PLAY LONG TOSS WITH A WEIGHTED BALL! The forearms and wrist are not only instrumental in throwing, but also play a key part in hitting mechanics, so this exercise has a two fold benefit. You can purchase a wrist exercise weight or make your own simple one, both are equally effective. Standing with feet shoulder width apart, using a weight attached by small rope or strong twine to a rod like devise, such as a cut off broom handle, roll the weight up to your hands, then unroll the weight lowing it back to the floor. The amount of weight is determined by your strength, but I’d suggest beginning at 3 pounds and work up from there. In this particular case, the heavier the weight, because you’re wanting to build muscle mass, is slightly more important than number of reps.